Always Aubrey: Money Matters @Mint... I'm obsessed! UPDATE (3.4.15): I noticed this post getting a lot of traffic, and I wanted to leave a quick note. The funny thing about this post is that while it reads like "sponsored" content, it was actually just me completely fangirling over Mint on my own accord... and now, almost three years later, I am STILL using Mint to manage my finances. I can see my 401K and investment growth, my MBA student loans, my new car loan, all of my accounts, and more. When I get married, I will add my husband's account info here to manage the combined family budgets and bills. I'm still obsessed... and I've converted others. You need to try it! I am officially obsessed with Mint. If you are a money-conscious diva (or dude), this website/app will put you over the moon! Seriously, it's amazing. Before Mint, I tracked my budget on an Excel spreadsheet (i.e. only on my personal laptop) and looked at my mortgage, credit card, and investments on different websites. I also used web/phone apps to keep tabs on my checking account. That's a lot of different sources, right? 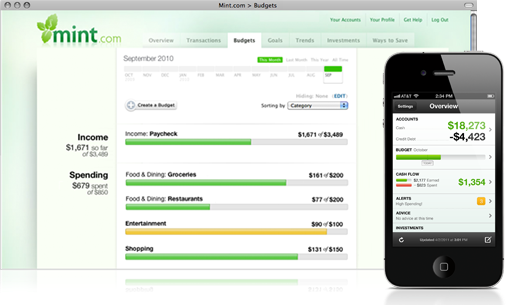 Over 7 MILLION people use Mint to keep tabs on their finances. It allows you to add ALL of those accounts to one central location, completely protected (Verisign, McAfee, and Truste certified!) and honored with praise from the NY Times, Money, and more. They guarantee bank-level security. I'm in love. I have everything at my password-protected fingertips, so I don't have to remember a ton of different account numbers when I'm on the go. I can figure out strategies to invest, manage/track my budget, and even set up alerts to text message me when my balance is low or a large purchase is made. It's the perfect tool, and it's FREE. I love that I can see my cash, investments, and bills all in one place, with awesome graphs and even advice. Check it out! You may be seeing WAY more green in your future, because you're more conscious of where your money is at all times.